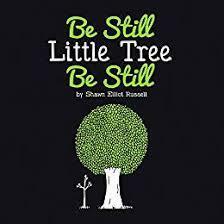 Written after a journey through debilitating anxiety and health issues, “Be Still, Little Tree, Be Still” tells the tale of a little tree who learns how to overcome his fear of storms with the help of an older wiser tree. He learns to feel the rain as it falls, the wind as it blows, and how storms aren’t trying to hurt him but are meant to help him grow. After growing into a big, peaceful, brave tree, life comes full circle as a new little one is planted, becomes frightened of a storm, and now it’s his turn to pass on the wisdom he learned so she can have peace as well.